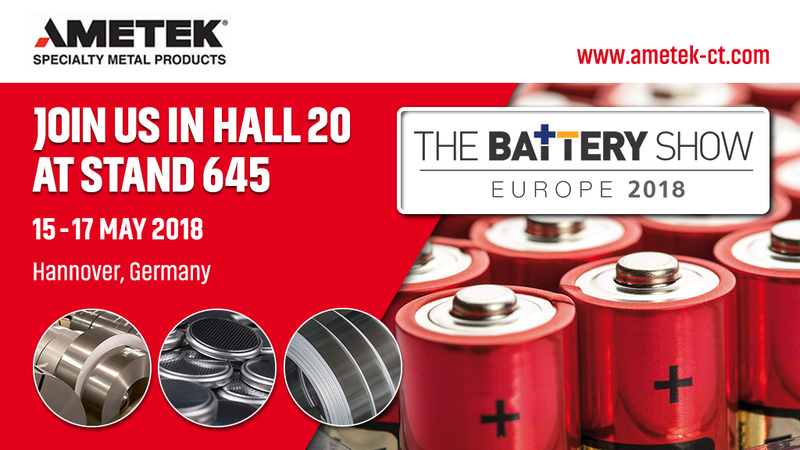 AMETEK Specialty Metal Products will be presenting the benefits of high purity nickel strip for critical battery applications at The Battery Show Europe, held at the Deutsche Messe in Hannover, Germany from 15th to 17th May, at Booth 645 in Hall 20. Europe’s largest trade fair for advanced battery technology, The Battery Show, is set to attract over 5000 visitors and more than 300 manufacturers and service providers from across the supply chain. On display will be thousands of designs, production and manufacturing solutions, including battery systems, materials and components as well as testing and recycling equipment for industries ranging from automotive, utilities, renewable energy and grid systems to power tools and electronics. For AMETEK Specialty Metal Products (SMP) using wrought Powder Metallurgy technology as base material to manufacture high-purity Nickel strip they can achieve a minimum of 99.98% purity. This results in up to 20% higher conductivity compared to standard Nickel 201 and ensures that tabs, terminals and contacts for rechargeable batteries will outperform and last longer than competing materials. Furthermore, strip can be formed, welded, soldered or plated more easily than traditional melt and cast materials, offering excellent and consistent formability for all applications making them ideal for use in computers, cellular phones, cardiac pacemaker cells, power tools and electric vehicles. Further product offerings from AMETEK SMP include Titanium and Stainless-Steel Strip, Specialty Shaped Wire, Metal foils, Thermal Management Products and Water and Gas Atomized Powders.